The next day was a grey day, damp and muffled, with a constant, unrelenting drizzle. Mhumhi huddled together with Vimbo by the entrance to the tunnel, where it was at least somewhat dry, if hard and cold. He slept fitfully. It seemed he should have slept well, for all the night’s events had exhausted him, but though his aching body begged for it his mind could not rest. For some reason what he kept thinking about was Maha, and how he wished she were still there, and how strange that was. How domesticated was he? He’d loved her so much… He would never have put her on a train with Hlolwa. Perhaps that was why she had died. Over and over his mind turned, until he had nothing but a useless jumble of sensory information: her hands on his chin, her strange hulker giggle, how she bit the heads off rats, how she’d hit him with a plank, how she’d begged him not to eat her. Beside him, Vimbo gave a long sigh and stretched, before rolling onto this back, his forepaws crooked. Mhumhi glanced at his peaceful face, and then rose. He went out into the muted sunlight, blinking as the rain coated his fur in a mist of fine droplets. There were dim figures moving about in the rain: screamers, picking through the garbage, but he did not pay them much attention. He no longer had any real reason to fear them. He had nothing left to protect. He smelled flashes of the gray pack here and there: it seemed they had done a lot of ranging around the night before, perhaps all the way to the den. What had they thought when they had discovered it empty, had their plans thwarted? Maybe they had even spotted him and Vimbo, slumbering defenselessly in the tunnel. If so, they’d done nothing about it. He didn’t see any of them now. They must have retreated back to their hiding-holes when the rain started up, back to the fluttering shanties and the concrete house that had once been Sekayi’s. Mhumhi trotted up the side of a tall mound, shook himself, and then let out a mournful hoo-bark. He pricked his ears, even though he knew it was nearly pointless, hoo-barked again, and then heard an answer. A soft whistle. It was nearby. Mhumhi half-walked, half-slid down the mound and set off towards it, licking the moisture off his lips. He spotted a metal barrel, half-buried under a kind of overhang composed of bits of broken chairs and rusty metal wire and drooping cardboard. Reddish paws were sticking out one end. The barrel wobbled a little, and then she poked her head out. “Hello,” she said, in a rasping voice. Mhumhi was startled. She was marked all over with rusty bloodstains, particularly her neck and muzzle. He could not tell how much of it was her own. “What happened to-” he began, in a rush of concern, and then stopped. Mhumhi said nothing for a moment. The night before, in the dark, frenzied confusion of his fight with the gray pack, something had turned the tide for him. Someone had helped him. Kutta. “Why?” was what finally came out. It felt awful even to ask, but he had to. Why- after everything that had gone wrong between them? Mhumhi looked down and away. The question brought on another stab to his heart. But not of guilt. He wasn’t guilty for that… yet. Sheer disbelief did not cover the expression on Kutta’s face. She struggled to rise, rattling the metal barrel. “She’s not going to hurt him,” said Mhumhi. Kutta went slack-eared with incredulity. “She couldn’t even kill Sekayi,” he recalled aloud. Kutta opened her mouth, then turned an ear back. “At one point in our lives, not wanting to kill anyone wouldn’t have been an outstanding quality,” she said. “He could hope to be with his family,” said Kutta, sharply. “Not the way it is now,” Mhumhi said. Kutta made a sour expression, and then gave a sour little whine. Abruptly Kutta got up and staggered out of the barrel, trembling a little under the soft rain. More bite marks peppered her haunches; she seemed hesitant to put weight on her left rear leg. Kutta shuddered at the word, licking her lips. “I don’t care,” said Kutta, in a hollow way. There seemed to be nothing for them to say for a while. They both looked in opposite directions. Mhumhi felt a straining within himself, torn between wanting to comfort Kutta, to roll over and beg her to forget everything he’d just said, to lick her chin and be her brother again. The other part of him wanted to get up and walk away without looking back. That was Kutta. It caught Mhumhi by surprise, and he looked over at her. Her head was drooping, down towards the ground. “But even you had a conscience,” said Kutta. “Yes… Maha said his mother didn’t come back one day.” Even as he said the words, something sank in Mhumhi’s stomach. “Then she went to steal the gray wolf,” said Mhumhi. “Kutta,” said Mhumhi, drawing his ears back. Kutta looked at him, blinking from the rain, and gave a hoarse whimper. Mhumhi went forward and touched noses with her. They stood there, with that barest brush of contact, and cried together. The rain got harder, and thunder growled somewhere above the gray clouds. Mhumhi and Kutta walked slowly together, side by side, not quite touching shoulders. He felt so sore, not just from the night before but from the hundred thousand steps he’d walked, the hundred thousand struggles he’d been through. He knew Kutta felt the same, as she limped next to him. And ahead of them there were even more, if they chose; maybe there wasn’t even a choice in the matter. Mhumhi saw Vimbo pacing back and forth inside the entrance to the concrete tunnel before they got there. When he spotted them he gave a little cry and ran out, large paws slapping wet trash, and sniffed them over. He squealed at the sight of Kutta’s wounds and licked her sodden head. “I’m fine, Vimbo,” said Kutta, with a kind of weary amusement, and nuzzled him and raised her leg for him to sniff without prompting. They went back inside the tunnel and licked the rain from their fur. Vimbo licked Kutta’s wounds, and she spoke softly to him, in a kind of tired, nonsensical murmur. 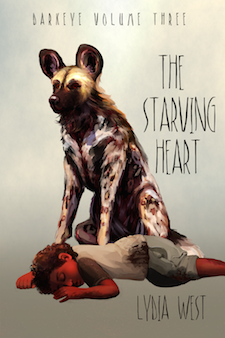 Mhumhi lay down on the concrete, one paw crooked underneath himself, and looked out into the garbage-filled vista. Mhumhi sighed, though her words weren’t really surprising. Mhumhi thought for a moment. “Do you love her?” asked Kutta. Mhumhi hesitated, uncurling his crooked paw. “I decide who I am,” said Kutta, tight-lipped. Mhumhi decided to let the matter go. “I’m not going to go back to the city right away,” he said. “No,” said Mhumhi, and put his chin down on the concrete. “If he wants to go,” said Mhumhi, glancing at the hyena, who was licking himself now. “Good,” said Kutta. “I’d feel better if he was there with you.” She licked his ears. Mhumhi looked up at her. Suddenly everything felt close and painful. “You could… you could come with me,” he whimpered. Mhumhi turned his eyes back downward, down towards the concrete. She nipped him lightly on the ear. “What had they thought when they had discovered it empty, had their plans thwarted?” and their plans thwarted? had their plans been thwarted?